Brother is back as the Exclusive Sewing and Embroidery Licensee for Season 14 of Project Runway. Tune in every week and watch contestants create runway fashions on Brother machines until the ultimate designer is officially chosen at New York Fashion Week. Don't miss the premiere of Project Runway: Thursday, August 6th at 9pm EST/8 CDT on LIFETIME. Don't forget to check out Brother's line of Project Runway Limited Edition sewing machines to create your own personal couture just like the designers on the show! With three models to choose from, Project Runway machines add style to your wardrobe with advanced features such as automatic buttonholes, a wide variety of built-in stitches, seven-point feed dogs and much more. 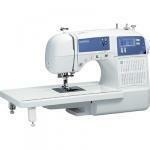 Enjoy greater creative freedom with the new LB6770 PRW, the first Project Runway machine with embroidery capability. Whichever model suits you best, you'll be well on your way to making a bold fashion statement.